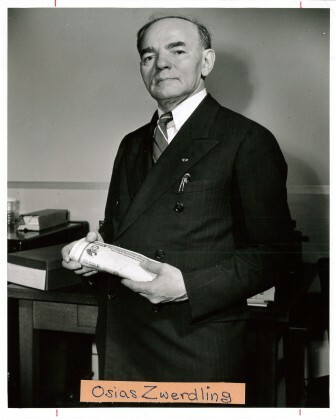 Osias Zwerdling, Founder and first president of Beth Israel Congregation, 1918-1958. 75th birthday, November, 1953. Hannah (Mrs. Osias) Zwerdling, Eunice Cook, Julian Cook, 1952. Beth Israel open house at 1429 Hill. 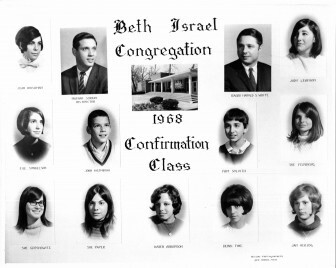 in 1972 Julian was ordained by Hebrew Union College, becoming the first rabbinical school graduate from Ann Arbor. 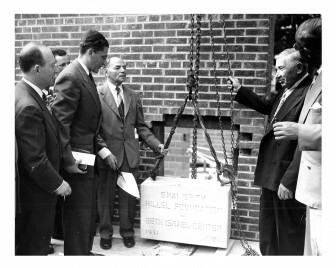 Beth Israel Open House, 5/27/1953. 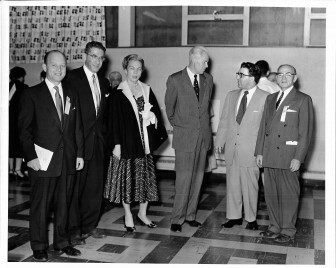 Herbert Schlager, Rabbi Herschel Lyman, Mrs. Hatcher, UM President Harlan Hatcher, Rabbi Weinberg, Osias Zwerdling. Rabbi White. Front row: Janet Stern. 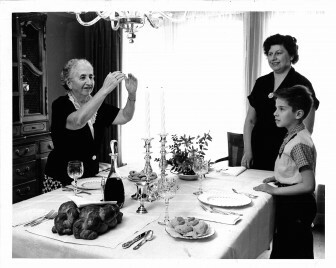 Rosh HaShanah, 1965. Beth Israel building on North Division. 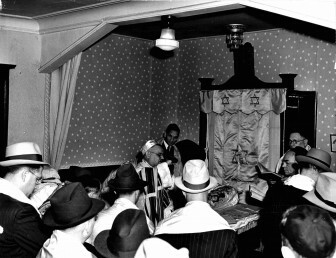 Rosh HaShanah, 1940. 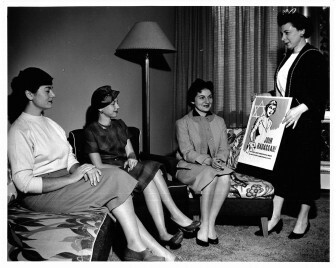 Left to right : Marilyn Krim, Audrey Levy, Faye Woronoff, Ruth Bass. October, 1957. Barry Margolis, center. Dan Sichel. Sisterhood Bazaar, November, 1966. Building shared by Beth Israel Congregation, 2102 Hill Street, corner of Onandaga. Some people lived there and served as part time help to Hillel. 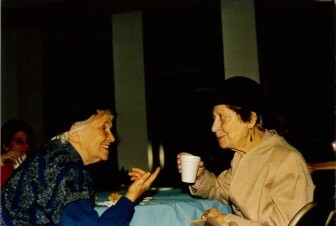 The left side had a big pantry and lounge use by Beth Israel Sisterhood. There was a small chapel on the second floor used by the minyans. 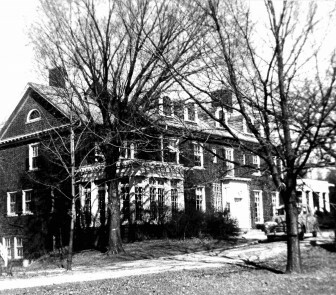 The first Hillel building was at Hill and Haven. This was temporary home while 1429 was being constructed. 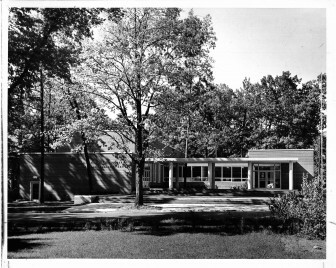 Beth Israel Congregation was known as Beth Israel Community Center when it shared its facilities with Hillel. 1429 Hill Street. Laying the cornerstone, 1429 Hill Street, 1951. 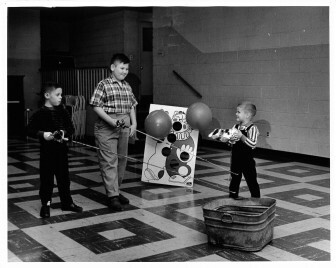 Herb Schlager (left), Rabbi Herschel Lyman (tall man), Osias Zwerdling (holding the rope), Tom Cook (holding the chain). Breaking ground, 2000 Washtenaw. 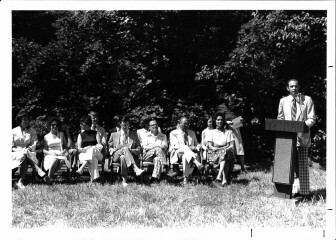 Ruth Siegel (with shovel), Monica Schteingart (3rd from the left in the back row), Bob Green (at podium), Morris Friedman (with the shovel), Jarvis Franzblau. 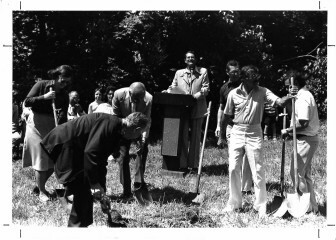 Breaking ground, 2000 Washtenaw. Eduardo Schteingart (podium). 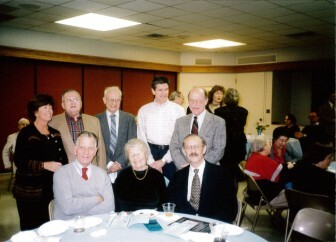 Molly Ingbar (3rd from left); Henry Gershowitz (5th from left, front row), Monica Schteingart (next to the podium). 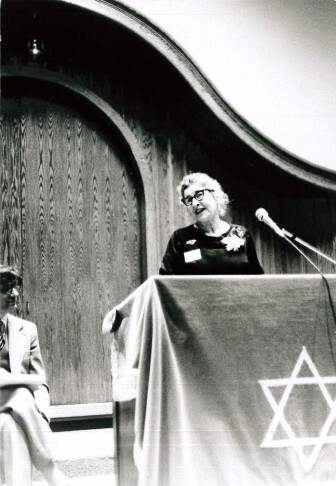 Gerda Seligson (1909-2002), the first woman to serve as president of a Conservative synagogue in the US (president of Beth Israel 1971-73), at the dedication of the 2000 Washtenaw building. 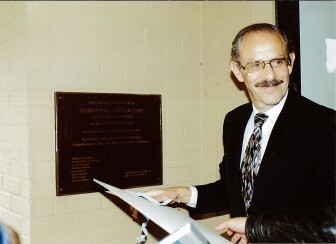 Henry Gershowitz (1925-1998) at the dedication of the 2000 Washtenaw building. 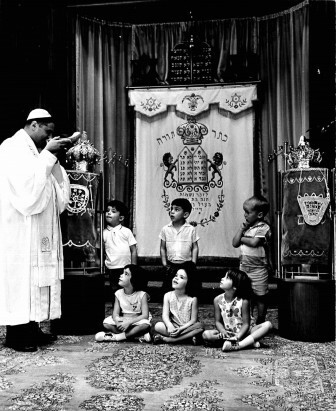 He was president of the synagogue in 1970 and again from 1994-95. 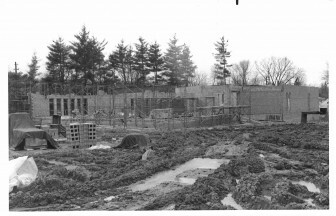 Building the synagogue at 2000 Washtenaw. Marching the Torahs from the 1429 Hill building to the new synagogue at 2000 Washtenaw. Sam Benjamin, Ed Schteingart, Hal Rotner, Monroe Hafter. Marching the Torahs from the 1429 Hill building to the new synagogue at 2000 Washtenaw. 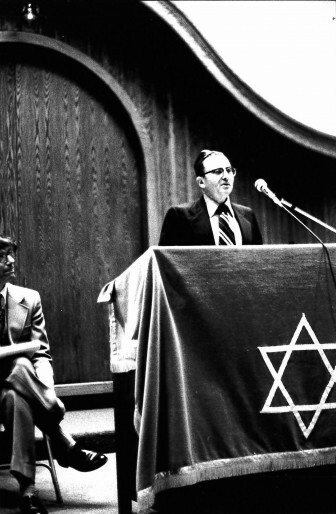 Rabbi Alan Kensky on the left, Henry Gershowitz on the right. 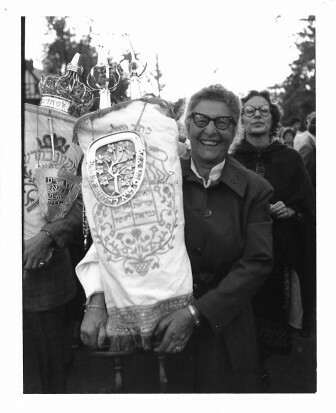 Erev Rosh HaShanah 1978. 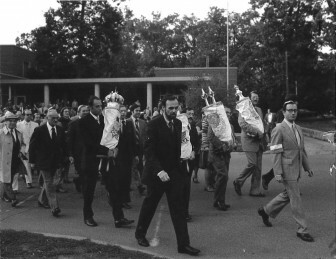 Marching the Torahs from the 1429 Hill building to the new synagogue at 2000 Washtenaw. Gerda Seligson. 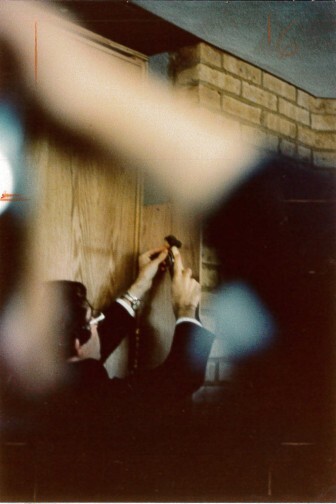 Rabbi Kensky affixing mezuzah to new building at 2000 Washtenaw. Dedication of the Garfunkel-Schteingart Activity Center, 2010 Washtenaw. 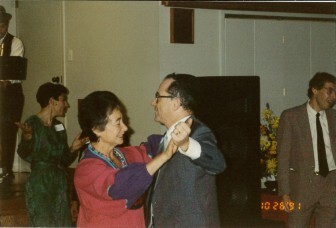 Eduardo and Monica Schteingart. Eduardo Schteingart at dedication of the Garfunkel-Schteingart Activity Center, 2010 Washtenaw. Presidents of Beth Israel. 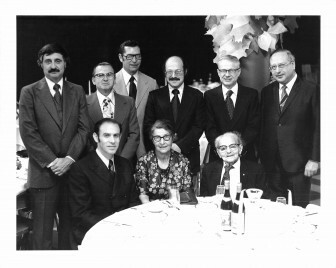 Back row, left to right: Jarvis Franzblau (1960-61), Henry Gershowitz (1970, 1994-95), Morris Friedman (1959), Saul Hymans (1969), Marty Sichel (1966), Paul Pressel (1967-68). Front row: Eduardo Schteingart (1974-78), Gerda Seligson (1971-73), Osias Zwerdling (1918-58). Presidents of the synagogue, at Jewish Theological Seminary of America program honoring Gerda Seligson. 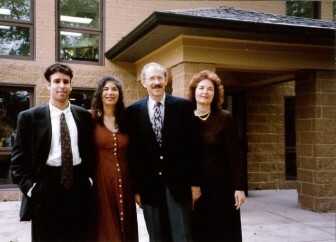 Standing, left to right: Susie Coran (1981-85), Henry Gershowitz (1970, 1994-95), Marty Sichel (1966), Errol Soskolne (1996-97), Saul Hymans (1969). Sitting: Carl Cohen (1979), Gerda Seligson (1971-73), Eduardo (David) Schteingart (1974-78). 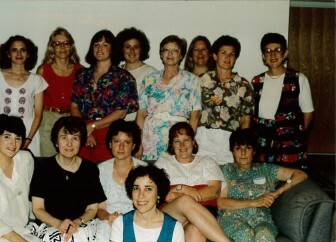 Beth Israel staff, circa 1992. BACK ROW: Aviva Panush (education director), Stacey Tessler (school secretary), Michael Pont (youth director), Jonathan Warren (custodian). 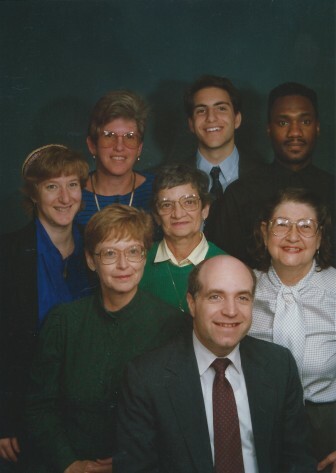 MIDDLE ROW: Martha Oleinick (Rabbi's assistant), Shirley Norton (librarian), Hilma Geffen (bookkeeper). FRONT: Rabbi Robert Dobrusin. 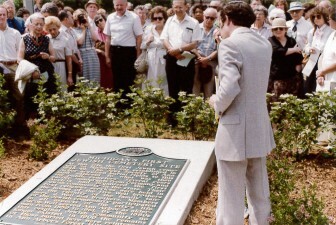 Dedication of the memorial at the site of Ann Arbor’s first Jewish cemetery, at Rackham. 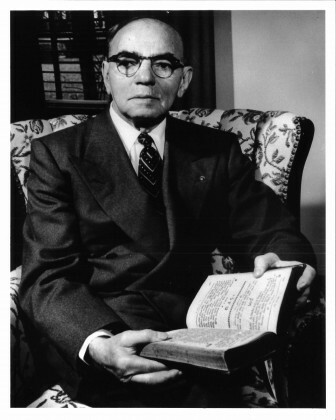 Rabbi Kensky. Anya Finkel. 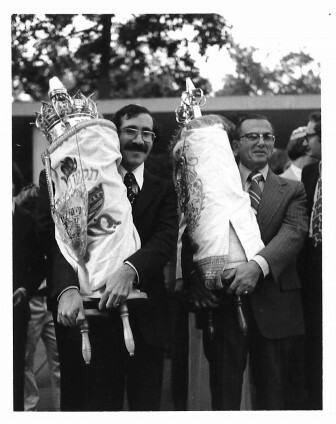 Beth Israel Torah Dedication, 1987. 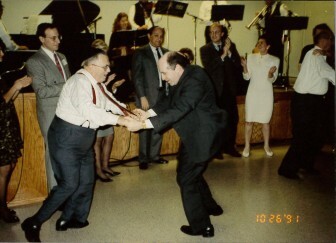 Monroe and Daryl Hafter dancing at the 75th anniversary celebration, 10/26/91.